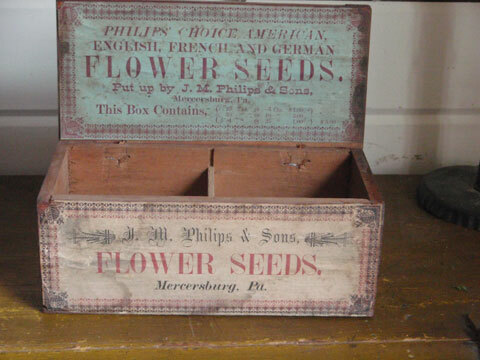 I am pleased to be able to offer 3 Philips’ Seeds Store Counter Boxes that were recently purchased from a dealer who had purchased them directly out of the Phillips’ estate. 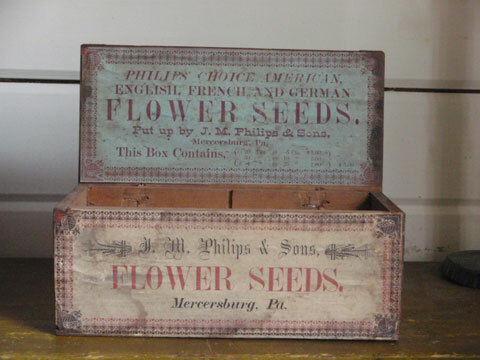 Phillips Seed Company was established in Mercersburg, PA in the late 19th C.
These boxes were given to shop keepers to display the seed packets. 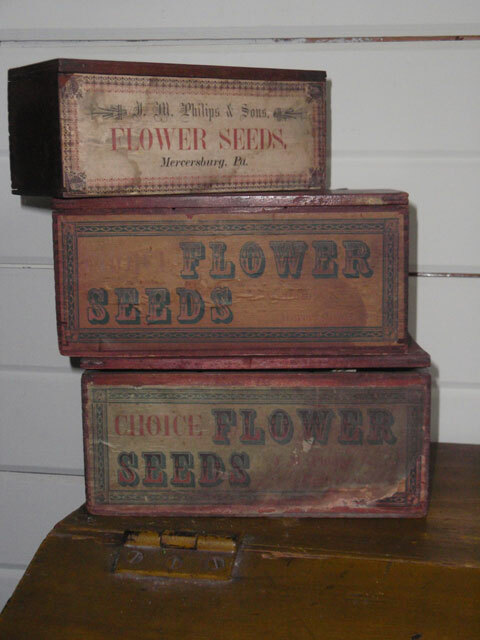 The storekeepers would save these boxes from year to year to display the seed packets. 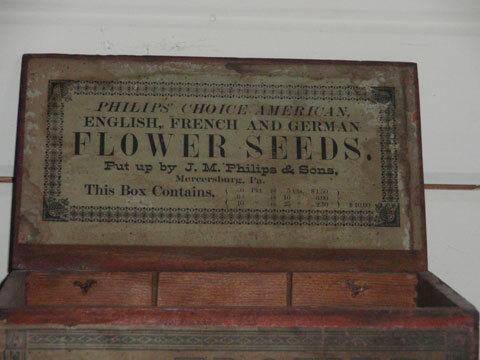 Each year they were given new labels to affix to the box fronts and interiors. 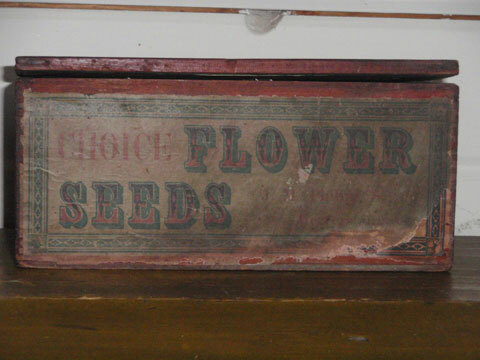 Some shopkeepers peeled the old ones off while others simply applied the new label over the old. 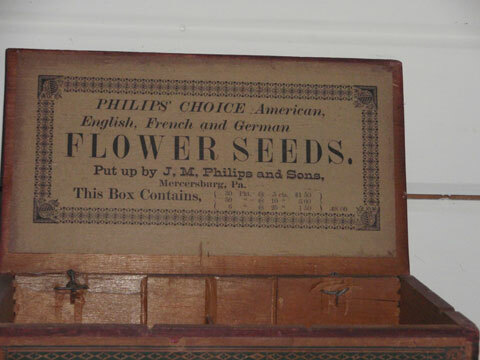 This method is apparent on Box # 1 as you can see a bit of the old label peering out from underneath in the lower right hand corner. 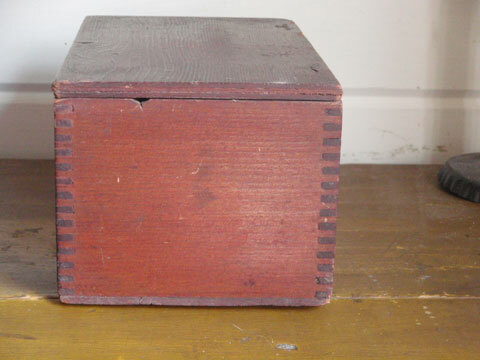 Box #2: Pine with red wash; Measures 8 by 4 by 4 ½ inches. 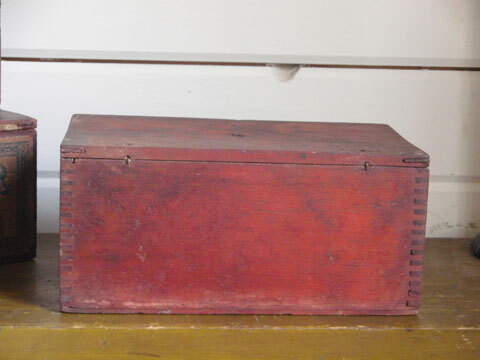 Exterior label in very good condition, interior label is excellent. 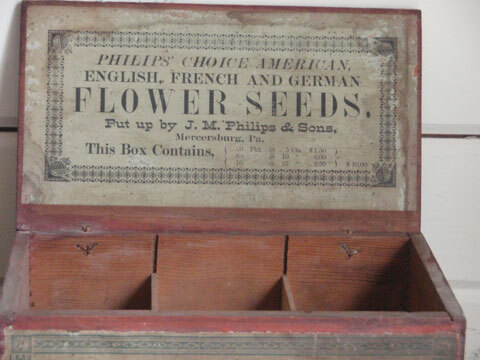 Interior of box is very good; old split in wood near left hinge (does not impact on lid closure); interior re-adapted for 2 packs in stead of 3 (done a long ago, probably as seed packets changed in size. 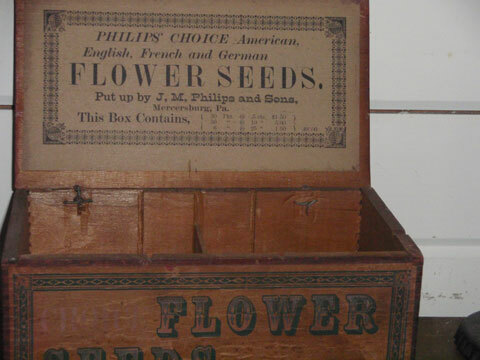 Box #3: Smallest and my favorite; possibly a bit older than the first two. 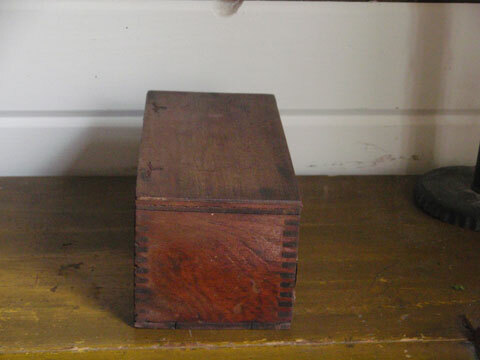 Pine; measures 7 inches long by 3 inches high by 3 ¼ inches deep. 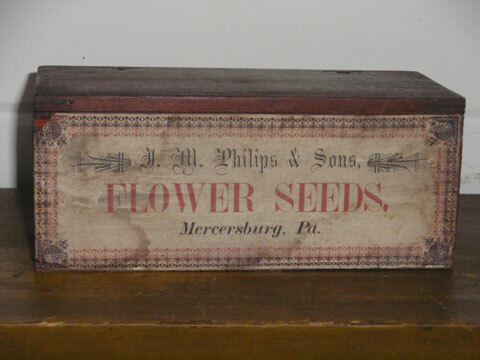 Labels on both inside and outside of box in excellent condition. 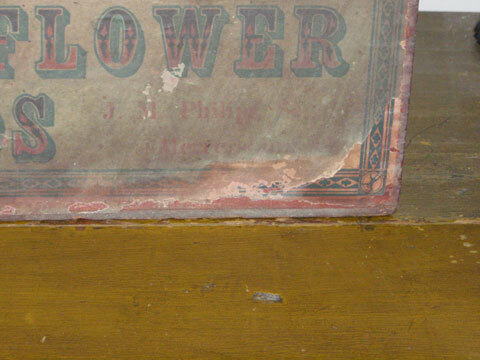 Interior condition is excellent; compartment divider replaced a long tine ago. 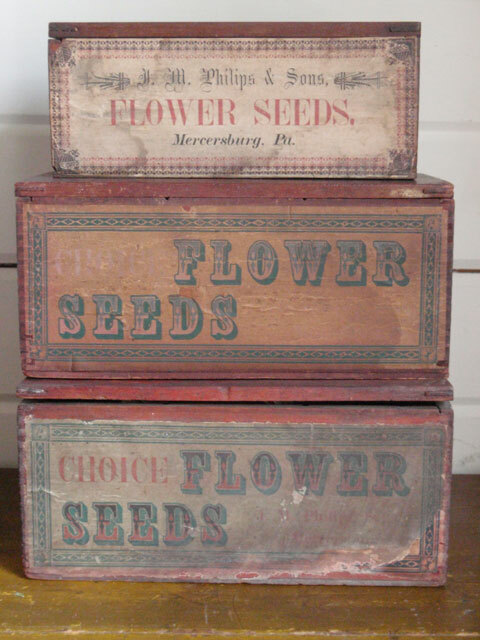 While the box labels are not filled with chromolithographs of flowers and vegetables, I think it is their humble and simple labels that make them very special and a bit different than the other boxes. 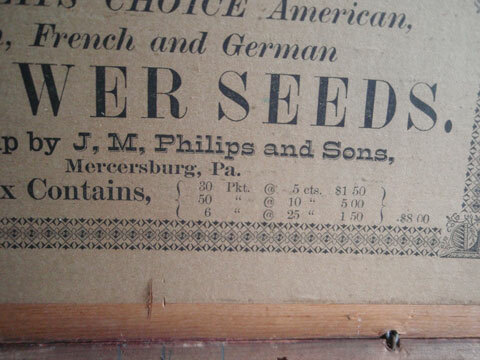 All the information you need is contained on those labels: Name of company, types of seeds and price. 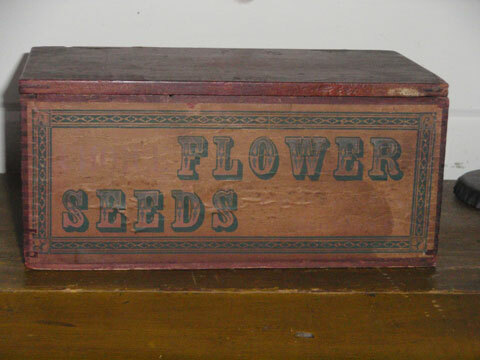 Very straightforward. 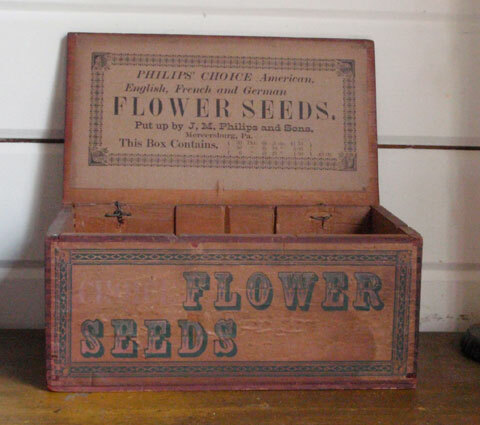 These are a must-have for any garden collector.